Herb Marks Freelance is a bit of a scrooge, but even though he would love to hide away until the holidays pass, he is forced into a retail nightmare he can't escape from. Air Pirates Radio Theater performs this quirky and unconventional holiday comedy on the 7th and 14th of December at Brothers Barbeque in New Windsor and at the Meadows in Middletown, respectively. 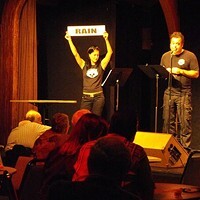 The original production will feature four actors and a cue-card girl indicating when audience members should participate. With a demonstration prior to the performance and cues during, audience members will be told when to slam a door, make footsteps, or shoot a gun. The ensemble includes MaryLee Shorr, Brian Nieves, Alan Andrews, Kate Brannan, and Lindsey Graham. (845) 469-7563.